How do I sign up for RCU's External Transfer service? 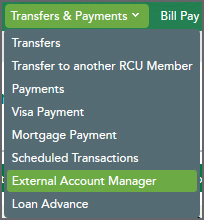 Note: The "External Account Manger" menu selection will be displayed for all accounts that are eligible to add external accounts. If this menu selection isn't listed, then this option may not be available. Please contact us if you have any questions about your account. Next, click on "Add External Account"
Note: The "Add External Account" button selection could be disabled or not visible if your account has not been open for more than 30 days or if you don't have an email address on your account. If you have any questions about your account please contact us. For security purposes, a verification code is required to complete the Identity Verification process. Select your preferred delivery method and we will send you a 6-digit verification code. Note: If you would only like to use this account to make payments, account verification is not necessary. Redwood Credit Union only requires you to go through the verification process if you want to transfer money between your accounts. 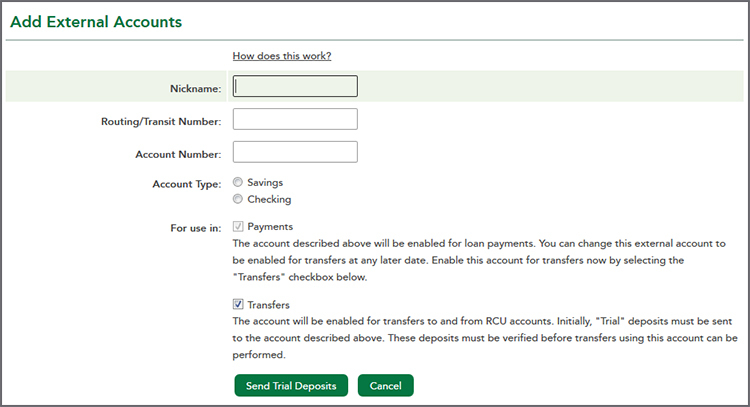 You will now be able to set up and complete transfers to and from your external accounts. 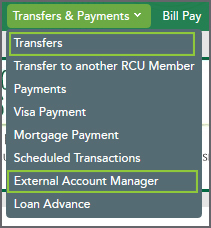 You may access the approved accounts by going to the Transfers & Payments tab and then selecting either "Transfers" or "External Account Manager." Does the External Transfer service have transfer limits? Why can't I sign up for the External Transfer service?